Matsubayashi-ryu, also known as Matsubayashi Shorin-ryu, is a school of Okinawan Shorin-ryu karate founded by Shoshin Nagamine (1907-1997) in 1947. Its curriculum includes 18 kata, 7 two-man yakusoku kumite (prearranged sparring) routines, and kobudo (weapons) practice. 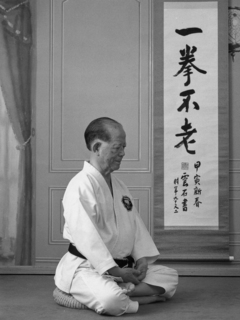 Nagamine Sensei named his school in honour of masters whom he viewed as two of the most important forebears of Shorin-ryu, Sokon Matsumura and Kosaku Matsumora. He chose to name the school using kanji characters that can be pronounced in Japanese either as "Matsubayashi" or as "Shorin." Therefore, it is correct to refer to the school as "Matsubayashi-ryu", "Shorin-ryu", or "Matsubayashi Shorin-ryu". Most people today choose one of the "Matsubayashi" variants in order to avoid confusion with the other many schools of Shorin-ryu.